The Pick-Up proudly stocks four of Zambo’s creations. 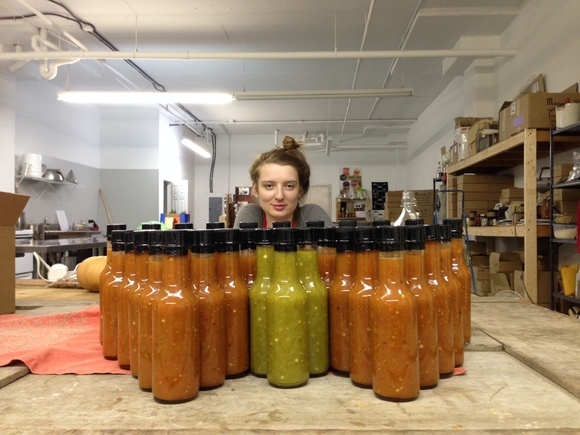 Capsicum Carota is a carrot sauce with habanero; Eriquito features roasted tomato, garlic and onion with chipotle; Caribbean Cat mixes green papaya and bitter melon with habanero, and Baby Girl is an intriguing blend of jalapeño, mango and tequila. Today, the sauce scientist is conducting her trials in a rented kitchen while building the business end of her enterprise. The existing small jars are soon to be redesigned and rebranded. Asked about further plans for the future, Zambo says, “I wanna make a hangover sauce.” We’ll be keeping a close eye on this development. Follow Zambo’s Hot Sass on Facebook and Twitter.